I lost my job this week, and then wham - today all Futureshop employees were let go - some will be able to re-apply for a job similar to their old job if their store is changing to a Best Buy. I don't ever want to work in a retail environment like that ever again. But chances are, I will. 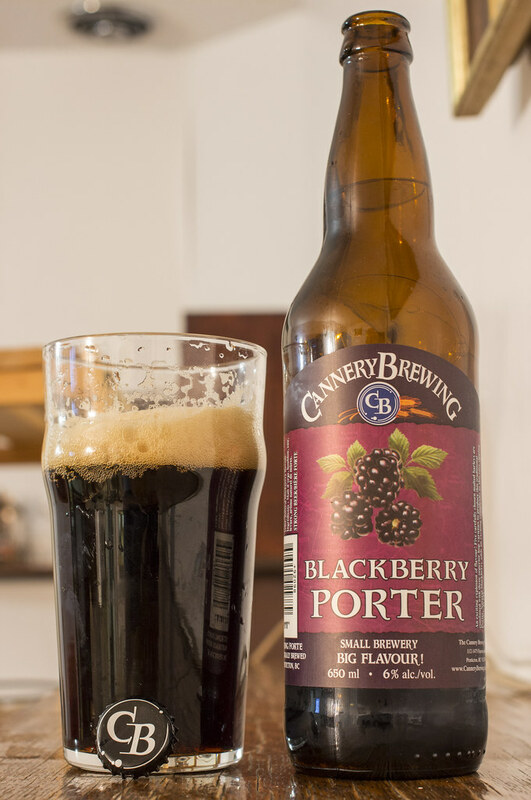 Now I have time to review beers out of my big hoard that have been collecting dust, including this beer - Blackberry Porter by the folks over at Cannery Brewing out of Penticton, BC. Appearance: The Blackberry Porter pours a dark dark beer, almost like an English dark ale. It has a bit of a caramelly brown head, which goes down fairly lightly. Overall, not quite 'almost pitch black' like a standard porter, but still looks nice and creamy. Aroma: The aroma doesn't seem like much at the beginning as all I notice at the beginning is toasted barley, a bit of notes of grassiness and a hint of coffee. As the beer settles in the glass, I notice a big whiff of Okaganan fresh blackberries doing the cha-cha-cha into my nose. It's a sweet, dark fruity and tart combination. Reminiscent of raisins, cassis and black cherries. There's a bit of a syrupy sweetness to it that reminds me of jam filled danishes/croissants. Quite sweeter than your typical porter but then again, when I used to drink their Maple Stout, I thought of it as a breakfast in a bottle. Taste: I'm really not expecting this to be in any shape a porter. Why? Fruitiness and porters don't usually go together. Fruitiness and wheat ales are more so what I'm used to. There's certainly a lot of blackberry in here. It's sweet, it's a tad tart like cranberries but it works in a porter or stout. There's a sweetness combination of fresh picked blackberries and a bit of a puréed syrupy sweetness to it. In the background, it's a light porter - notes of roasted malt to give it a bit of a hint of coffee and chocolate profile to it. As it warms up, the sweetness/bitterness ratio evens out. It's a nice beer to have when winter just won't simply end, it makes you look forward to picking fresh fruit.. though I'm not a fan of that. Overall Thoughts: A nice porter that's a bit lighter than most for bitterness, it's more of a really heavy dark ale. There's a nice amount of blackberry all over with a hint of medley of other dark and tart fruits. Somewhat syrupy, but enjoyable. 6.5% ABV/650mL bottle. Cannery's Naramata Nut Brown is coming to Manitoba soon, watch out! I had a friend from BC send this to me. Their Naramata is coming to Manitoba. I really really miss their maple stout. THAT is the real maple beer.